Hot on the heels of Police Minister, Fikile Mbalula, encouraging the use of technology in the fight against crime, the Namola Safety App has launched across Gauteng. And plans are now underway to roll it out nationally while foreign counties have started showing interest. The Gauteng Community Safety Department and Gauteng Traffic has started a pilot project which has an initial 20 vehicles fitted with tablets- based on the Uber taxi system. The Tshwane Metro Police Department (TMPD) was the first to use Namola over a year ago. Over 240 cars are fitted with devices which leads officers to crime scenes within minutes. Namola Chief Ambassador, Yusuf Abramjee, said South Africa was leading the way with technology. “With all the problem at 10111 centers, Namola is the solution. We are talking to the SAPS. Police Minister Fikile Mbalula is looking at it also. “Smartphone users can download the app free and press one button during an emergency. We guarantee a call back time of under 90 seconds and authorities are immediately alerted,” Abramjee said. He said the entire Gauteng has GPS location which means victims don’t have to waste time explaining where they are. “This app is the latest weapon in the fight against crime. We have to embrace technology and we hope to take Namola to every corner of South Africa this year.” Abramjee added. Namola has almost 11 000 downloads and the numbers are increasing by the day. “With Gauteng live now, we expect the downloads to increase substantially,” added Abramjee. 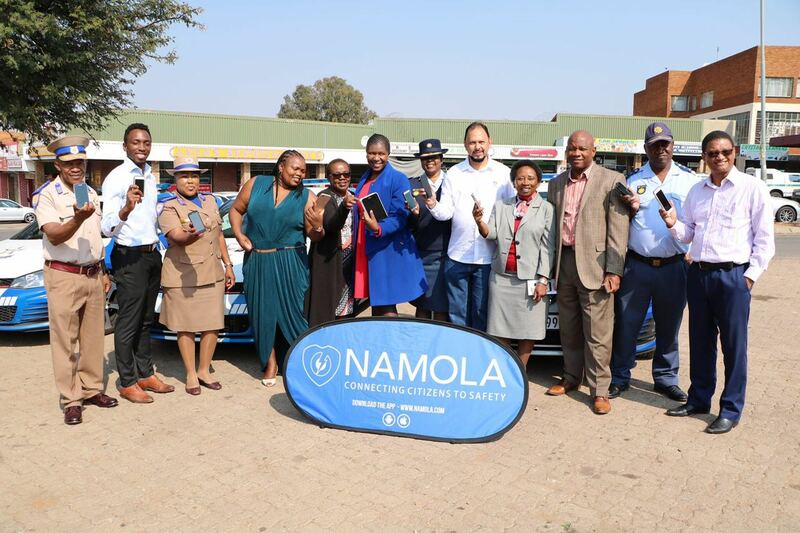 Gauteng Community Safety MEC, Sizakele Nkosi-Malobane, said: “Namola is the answer in our quest to improve efficiency and effectiveness in response times of our law enforcement agencies as well as emergency services to crime scenes. “This partnership will contribute immensely in our fight against crime and ensuring that Gauteng citizens are and feel safe. “We are witnessing a ground breaking launch… ‘Namola’ which means ‘To help out’ is designed to improve the alert and despatch times to under five or so minutes. “This innovation should be applauded because for some time there has been an outcry by certain members of our communities about the delay in response times to crime scenes and emergency incidents but I am excited that with implementation of this innovation that will be the thing of the past,” said the MEC. “Namola speaks directly to the Gauteng Government’s ten pillar programme: that of Transformation, Modernization and Re-industrialization which aims to confront some of the challenges facing policing in our Province. “I am also excited that the invention of this technology is taking place in the backdrop of Gauteng City Region initiative to integrate radio communication of all law enforcement agencies in the Province. This is an important milestone, which will assist in maximizing the utilization of available policing resources in the province,” said Nkosi-Malobane. “The technology is made up of three elements namely; a user app for citizens to request assistance, a tablet fitted in response vehicles for quick alerts and response, and a call centre operation based at the relevant despatch office to validate alerts. Nkosi-Malobane added: “It’s all systems go. We have already installed the application in our fleet, test runs have been conducted, a control room has been set up at our head office and it’s fully functional. I am excited by this new development and that our people will be able to receive assistance quite speedily. “Recently Gauteng experienced a spate taxi rapes and robberies and I appeal to the taxi industry to embrace this innovation to improve the safety of its passengers. “Crime fighting is a collective responsibility that requires partnership from all sectors of our communities and I am confident that this partnership will inspire other sectors to play a meaningful role in our quest to ensure Gauteng citizens are and feel safe,” she added. *The Namola Safety App has been launched in Gauteng. 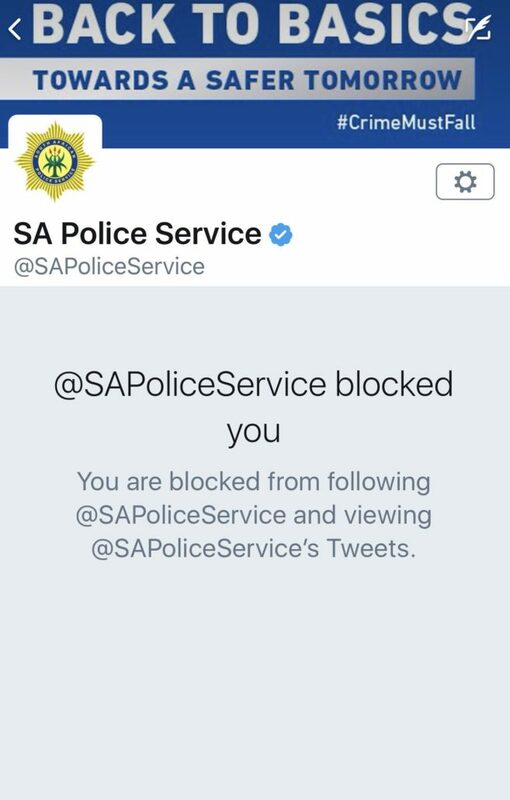 Well known anti-crime activist, Yusuf Abramjee, says a decision by the South African Police Service (SAPS) to block his twitter account is “childish and immature” and he has called for an urgent investigation. @SapoliceService blocked @abramjee this afternoon causing lots of anger. Abramjee said he has asked Police Minister, Fikile Mbalula, to urgently investigate the matter. “I suspect I was blocked because I tweet incidents of crime constantly and hold police to account. If anything, the decision to block me will make me even more determined to continue exposing crime, corruption and police inefficiency,” Abramjee said. Abramjee has been in the forefront on anti-crime campaigns over the years. He is an Interpol #TurnBackCrime Ambassador also. He added that he is also considering reporting the matter to IPID.